When Hollywood effects master Rick Baker wants to help make his family some Halloween costumes, everybody comes out having a better day. Baker—famous for his work on Thriller, An American Werewolf in London and Men in Black—and his family decided to go with a Joker theme this year, the exception being his wife Silvia, who went as Harley Quinn. His daughter Rebecca went as Heath Ledger’s Joker from Dark Knight Rises, while her boyfriend Kyle was dressed up like The Man Who Laughs, an early inspiration for the character. 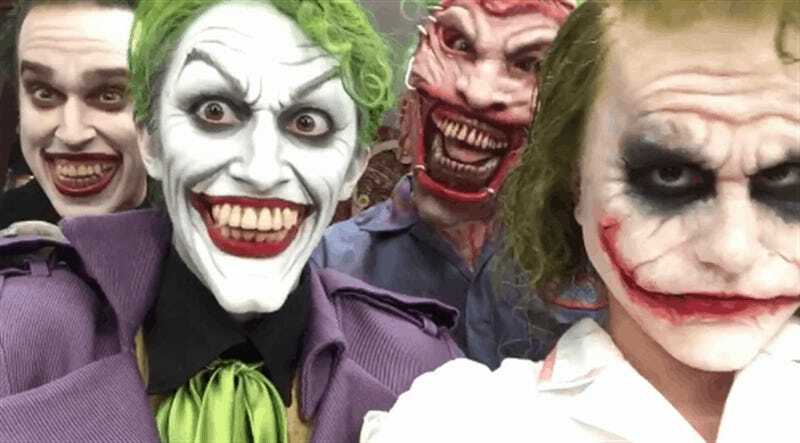 Baker’s daughter Veronica—who works at DC Comics—went as Killing Joke Joker, while Baker himself (accompanied by Silvia’s Quinn) went as New 52’s Faceless Joker. Photos by Steve Koch. And if you’re now in the mood for some more quality Batman cosplay, check below.